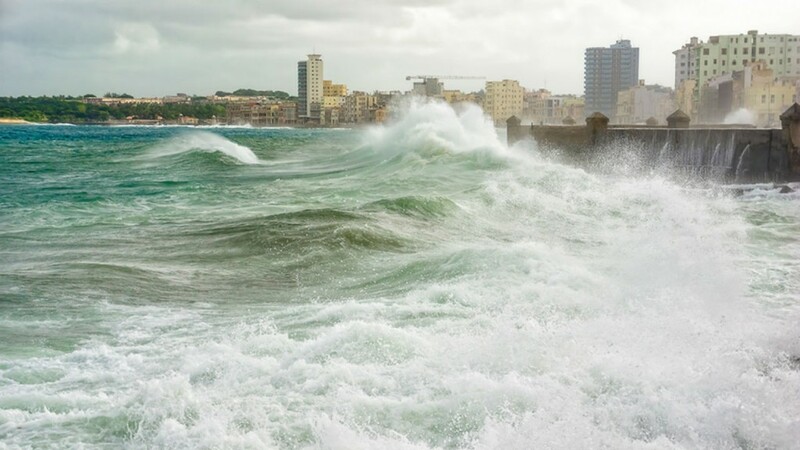 Storm surge attacks a seawall protecting coastal city. One of the primary decisions of the contractor, based on the hydraulic conditions, is what pumping equipment to utilize. This decision will be based on numerous jobsite conditions such as; flow required to mitigate water seepage, depth of a coffer dam, and solids content. The contractor’s selection of pump type usually comes down to self-priming centrifugal or submersible pumps. Engine driven self-priming pumps are one of the choices available to contractors. One drawback of using end suction centrifugal pumps is that they do not fare well when the liquid is below the pump centerline. Liquid must be delivered to the pump so the process can begin. Air on the suction side (piping and pump casing) of the pump needs to be totally evacuated. If air exists in the centrifugal pump, it will become “air bound” and incapable of pumping. The self-priming centrifugal, a specialized end suction pump design, creates a vacuum at the impeller eye to continuously remove air from the suction line. The pump is not capable of compressing the air during the priming phase and it must be allowed to escape through the discharge. As air is removed, atmospheric pressure forces water up the suction piping to the pump, allowing the pump to operate. The self-priming process occurs automatically once the pump is started with the initial quantity of liquid. This priming process can be complicated when the pumped liquid contains sand or solids. The practical suction lift limit for self-priming pumps is around 8m (26 feet) of liquid under ideal conditions. The disadvantages of self-priming centrifugal pumps are numerous. Any small vacuum leak, such as sealing areas around connectors in the suction line, or pump seals can prevent the unit from priming. The pump will continuously pull air from the leak instead of the air in the suction line, thus, never allowing the priming cycle to be completed. This is a common cause of priming failure. The leak can be very small or invisible to the naked eye but can prevent priming. The diameter and length of the suction hose or pipe can also affect prime time due to the volume of air to be evacuated during pump priming. This extended priming time can add heat to the liquid which can further extend prime time. Self-priming pumps need to be located as close as possible to the water source. It is best to be located directly above the coffer dam with as few restrictions (such as elbows) as possible to reduce friction. Again this can present problems dependent on the excavation location. Once the pump is primed and pumping it will require adequate net positive suction head (NPSH) to remain pumping without suction limitations. Without sufficient NPSH, a self-priming centrifugal pump can cavitate and lose prime. Lifts through long suction lines, especially containing obstructions, can be plagued by cavitation problems resulting in unacceptable noise levels and possible equipment damage. If a self-primer is required to lift water 15 feet or more from the source to the pump’s suction, the pump capacity could be decreased significantly. Submersible pumps, being located below the water level, typically do not have this same suction limitation. Most self-priming centrifugal pumps on remote applications utilize engine drives which in itself can present operational issues such as fuel levels for long run times, engine oil condition, and other prime mover maintenance issues. Hard metal submersible pumps with integral agitator provide long service life in dewatering excavations where entrained sand is a problem. Using submersible pumps can offer many operational and application advantages. Pumps are submerged directly into the water for immediate use and unit cooling thereby eliminating priming issues or extended prime times. No worker intervention is required. Pumping action occurs from direct submersion in the liquid feeding the pump without the need for a suction line. Submerged pumps are quiet. Cavitation issues are extremely rare, and may occur when the sump is too small for the size of the submersible pump that is in it. Submersible water pumps are lighter in weight and highly portable. The versatility and low maintenance of submersible pumps make them an ideal option for dewatering service. No regular maintenance is necessary. Submersible pumps usually need to be fully submerged. The water around a submersible pump actually helps to cool the motor. The sea level along the Gulf Coast is rising faster than most places on the globe. Galveston Texas has experienced a three foot rise since the disastrous flood of 1900 that killed thousands of people. One of the toughest jobs in rebuilding the infrastructure of a city that is just a few feet above sea level is keeping the water out of your construction site – particularly water that is laden with sand. Pumping a water/sand slurry is tough on pumps – particularly aluminum dewatering pumps. When Boyer Construction was doing work in Galveston, Texas, they had to deal with this condition. Galveston Island, located in Southeast Texas, runs west to east, and is slightly tilted to the northeast end, where the City of Galveston is located. The north side of the island opens up to a protected harbor, while the southern side faces the Gulf of Mexico. Before the 1900 Hurricane - which still holds the unenviable record of the most deadly natural disaster in American history with 6,000 deaths - the highest point in Galveston was 9 feet above sea level. After the 1900 Hurricane, a 17 foot seawall that ran 3 miles long (since extended) was built to protect the city and its people from other storms. Constructing the seawall was easy compared to the next step, which was raising the entire city up to the edge of the seawall, then sloping the island down 8 feet above sea level on the north side of the island, so water getting over the sea wall would drain into the bay. This engineering feat, worked on for over 10 years, was accomplished by pumping a sand and seawater slurry underneath buildings to raise the island. The seawater ran off leaving the sand, and thus building up the island. Since then, hurricanes have hit Galveston, but never having the impact of the great 1900 storm. In September 2008, Hurricane Ike devastated Galveston Island along with the Bolivar Peninsula, and Gilchrist, Texas with sustained winds of 110 mph, and a 22 foot storm surge. Property damage was estimated at $29.5 Billion and 135 people died in the United States due to the storm. The downtown area of Galveston had 6 feet of standing water in it after the storm passed through. As is always the case after a hurricane hits a populated area, the rebuilding effort takes years of hard work, and millions of dollars to repair the damage done. One of the companies, who worked on the rebuilding of Galveston, was Boyer Construction. Boyer Construction is a 20 year-old construction and engineering company specializing in Civil, Electrical, Mechanical and Inland Marine construction projects. Based in Northwest Houston in an 18 acre facility, over 250 engineers, master electricians and plumbers, equipment specialists, and skilled fabricators, have worked on various rehabilitation and infrastructure replacement projects throughout Southeast Texas. Many of those projects, including those in Galveston required dewatering pumps to be used on coffer dams and large excavation jobs. These demanding services require continual operation, pumping water that is often laden with silt and sand. Couple continual cycling with salt and brackish water and you have elements which will minimize the life of most dewatering pumps. submersible lightweight agitator pumps provided a heavy-duty solution at an economical cost. They offered the flow range and high lifts required for a broad spectrum of applications. From 2 horsepower (flows to 180 GPM and heads to 55 feet) to 10 horsepower (flows to 475 GPM and heads to 117 feet), they are designed and constructed for difficult services. The LWA is a proven performer on tough dewatering services such as sand, silt, coal fines and spent drilling mud. The impeller and wear plate are made of abrasion resistant chrome iron, while the agitator and volute are constructed in hardened ductile iron – perfect for the salt/sand slurry and solids-laden water Boyer Construction would encounter. The integral agitator is designed to mix settled solids with pump water to maintain a steady solids concentration and discharge volume. Boyer Construction field tested a couple of LWA pumps on their Galveston jobsites, and were delighted with their performance and service life. Over the subsequent two years, Boyer Construction purchased over 25 LWA units. Every jobsite has its own particular set of pumping conditions. Selecting the optimum pump for the service takes the collaboration of a competent contractor and a hydraulic specialist. The right choice of equipment can make a substantial impact on the timely completion of the project and your bottom line results. Coastal developments along the Gulf are at risk from storm events. Dewatering pumps are required in high water table areas to keep construction sites dry.